Comments: For some unknown reason, Obverse 3 and Reverse D are paired for a second time. Dimes struck from the second die pairing are listed as Variety 104a and feature reverse die rotation of 18 degrees right. 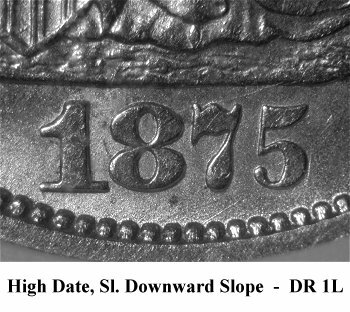 Of most significance, is the occurrence of an "unfilled" Micro S mintmark on Reverse D during the second die pairing. This unfilled Micro S mintmark variety is rare and rated as R6 in grades of VF or better. 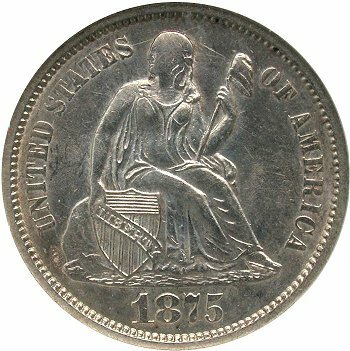 I have personal seen no more than five examples during years of researching Seated dimes. 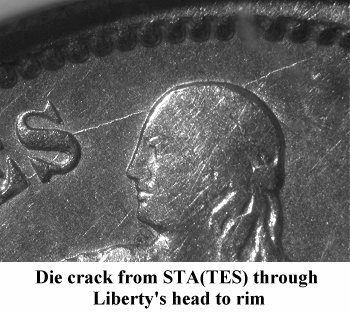 Obverse 3 is in a later die state with an obvious die crack from the top of STATE(S) through Liberty's head and exiting to the rim. On high grade specimens, a die line is seen at the right edge of the shield below the horizontal shield lines and could be the misplaced top loop of an 8 digit. 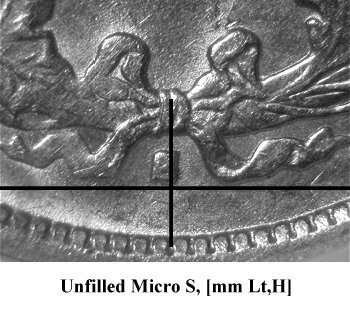 Use the die crack through Liberty's head as the primary diagnostic for the Variety 104a die pairing, then inspect the mintmark to determine if "filled" or "unfilled". 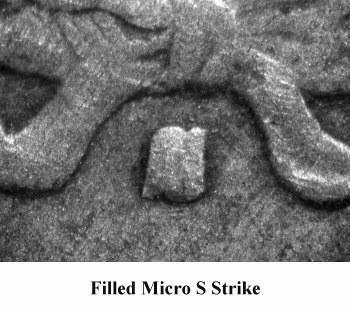 I have studied the mintmarks on the Variety 104 and 104a plate coins under microscope and believe strike quality is responsible for producing "filled" or "unfilled" variations. On the Variety 104a plate coin, the top of the mintmark is higher than the surrounding ribbon ends while on Variety 104 dime, the top of mintmark is lower than the ribbon ends. 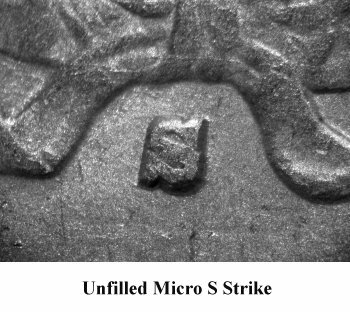 This observation indicates that striking force is critical for completely driving metal into the mintmark cavity in the reverse die to expose the separation of the upper and lower loops with the S mintmark. 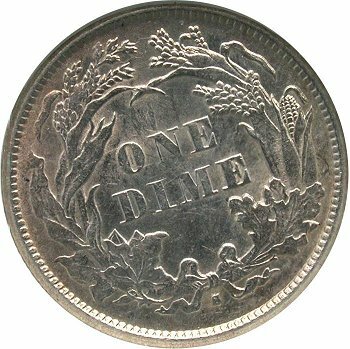 Interestingly, the "unfilled" S dimes seen still have flat heads suggesting ongoing striking issues at the San Francisco mint during their execution of a high volume production ramp.